This timeless 6mm Classic style domed tungsten ring is sure to get many compliments! With clean look that will impress even the most finicky shoppers. This 6mm tungsten classic ring could be used for a man or a woman since the 6mm size is right in the middle. 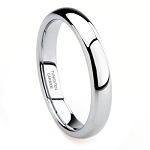 This Classic Tungsten ring also comes in a 2mm, 3mm, 5mm and 8mm. Imagine wearing a ring that never needs polishing, a ring that is virtually scratch proof. Tungsten rings are the future and your looking a one of the best styles out there! Features: High scratch-resistant tungsten, four times harder than titanium. Completely hypoallergenic, out tungsten carbide rings will never turn your finger green or cause irritation to your skin. If you need a durable yet elegant ring, this is for you! Included 100% Money Back Guarantee! Q: Is this a multi color ring, or is it just a glare from the light that makes it look like theirs a design on it ? Very interested in purchasing this item. Thank you, look forward to your response. What you see is a glare. This ring is completely polished all the way around, with no design on it. Remember, every ring can be simply exchanged or refunded within 30 days if you are not 100% happy. Happy Shopping! Q: When I receive the ring does it have to have tungsten carbide engraved on the inside? Can it be removed? Just about all of the rings we receive come with the 'Tungsten Carbide' stamp on the inside. Our factory can make rings without the 'Tungsten Carbide' stamp on the inside, but this would be a special order. There is not extra charge, but it will take 3-4 weeks. The stamp can not be removed once it is engraved into the ring. I hope this helps! Happy shopping! Q: I love the ring but will I be able to exchange it, if it does not fit? A: Rings can be exchange free of charge within the first 30 days. After 30 days, it is only $6.99. Q: If I want this ring with engraving, do you ship it with the engraving on it or do we send it back to have it engraved? A: Great question. When you order the ring with the engraving, by default, we will engrave it and then ship it out to you. Just remember, you are not able to return or exchange a ring that has been engraved. What you can do instead.... Tell us to send you the ring without the engraving at the comments box at checkout. That way you can make sure the ring fits perfect and that you like the style. We will send you the ring with a prepaid label, send it back and we will then engrave it for you. I hope this helps! Happy shopping! Q: Is this ring 100% Tungsten? 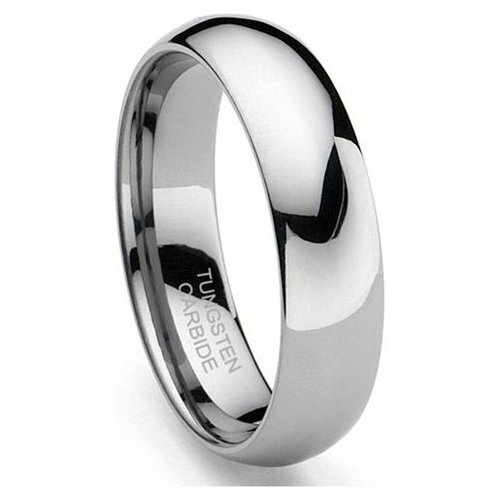 Yes, every Tungsten Ring we sell is 100% Solid Tungsten and stamped with the 'Tungsten Carbide' stamp on the inside. I hope this helps! The ring is awesome! The price was awesome! The customer service was awesome! The return and exchange policy was awesome! Overall, I'd say I got an awesome product at an awesome price from an awesome company! I could not be happier with this ring. It has a beautiful polished finish, making it look more expensive than it was. The ring is also very nicely finished making it very comfortable and nice to look at. Have no reservations, this is a great ring and a great value. What a great product and a great company! The shine lasts and lasts. I ordered a size too large the first time, they exchanged it with no hassle and promptly sent it back to me. I'd recommend both their products and this company to anyone. Beautiful ring! My husband of 40 years outgrew his original wedding ring and this is a wonderful replacement! The ring shipped within a week once ordered and I loved it, except that it was a size too big. It was very easy to ship back and within a couple of weeks, I had my new ring which fits perfectly. I would definitely recommend this ring for its simple, classic look and quality of material. Love this new style you just added. We were not sure to go to a 5mm or 8mm and this was perfect right in the middle. Love how fast you guys ship too! Thank you again - Happy Customers! It looks great. I can't wait to get married so I can wear it all the time. I love my ring, because I don't have to remember to take it off before I do certain things throughout the day. I love that it shines and feels smooth always. Got this as a 5 year anniversary gift for my husband. I had it engraved and it came out beautifully. I can't wait to surprise him with it. Really beautiful ring, true to description. This ring is excellent quality at a most affordable price. Getting the sizer is a fool proof way to get it right the first time. Received our rings within 6 days, unfortunately both too big. (totally my fault.I recommend using the paper ring sizer and trusting what it says!) Contacted Damien for no hassle return and reshipping of new sizes. Again 6 days and again no shipping fee! Amazing! My wife and I both love our new rings They are beautiful, classy and amazingly comfortable. We were complimented on them within hours and recommended Tungsten Fashions to the commentors! Thanks again TF. We are totally satisfied! This ring is great. The style and color are as shown in the ad and the fit was perfect and comfortable. What really impressed me as much as anything was the prompt delivery. The ring was shipped the same day I ordered it and was in my mailbox within 2 days. I will definitely recommend Tungsten Fashions. This ring is perfect. I ordered it because I wasn't wearing my wedding rings because they were getting beat up too much! I don't have to worry about that with this one. I had to exchange another ring for this one because it was too big- it was hassle free and I would def buy something from here again! !